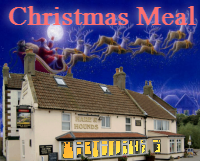 After discussions at last month’s meeting, it looks like we are bound for the Hare and Hounds once again for this year’s Christmas bash. It has been provisionally booked for December 9th for 19:30h. 12 places are up for grabs. You'll find the menu below. If you could let Mark know your choices as soon as possible it would be much appreciated. Corn Fed Chicken Breast Filled with Smoked Cheese, wrapped with a Rich Shallot Gravy, with Braised Red Cabbage & Creamed Potatoes.